People are often astonished that most police officers aren’t into shooting or guns, don’t train often with firearms and are lousy at marksmanship. But being armed and being skilled with your arm are completely different. Most cops don’t need to be good shooters because, thankfully, most of them don’t get into situations requiring lethal force. Statistically, most officers won’t unholster their duty weapon during their entire career, let alone point it at someone or fire it. In 2015, Toronto’s roughly 5,500 officers drew their guns 172 times on the beat, and 41 officers fired, according to the service’s annual report. So why train with a tool you’re unlikely ever to use? Because you never know when you’ll need it to save your life, such as shooting back while under attack to stop the attack. Shooting schools teach moving with a gun in your hand, and shooting while moving, in their self-defence classes. Some instructors recommend moving or shooting, but not both at the same time. 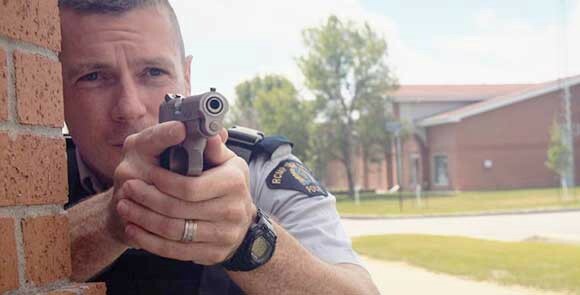 The Royal Canadian Mounted Police began training officers to shoot while moving in April 2016, the RCMP Gazette magazine reported in January, in an articletweeted yesterday by the RCMP. They made the change after investigating a June 2014 shooting in Moncton, New Brunswick, where a man shot three officers dead and wounded two others. The review concluded that the national police needed training and equipment to respond to such attacks. Until last year, officers had a four-hour Annual Firearms Qualification, where a stationary officer fired at a stationary target at a fixed distance, the Gazette said. That was it, a half-day at the range once a year. Now, after a one-hour test, officers get three hours of training, including shooting while moving, the magazine said.